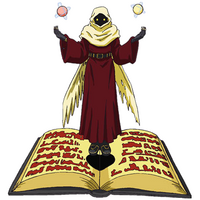 A Digimon completely shrouded in mystery, it can appear anywhere in time and space via the Book. Treating the Book as a spiritual vessel, it frequently alters its shape to appear anywhere within the spaces and times which the Book has connected, and it is said that its true form remains within a separate dimension. 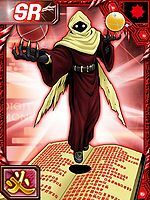 Among researchers it is rumored that it is in the same family as Piemon, and of the same Demon Man type. 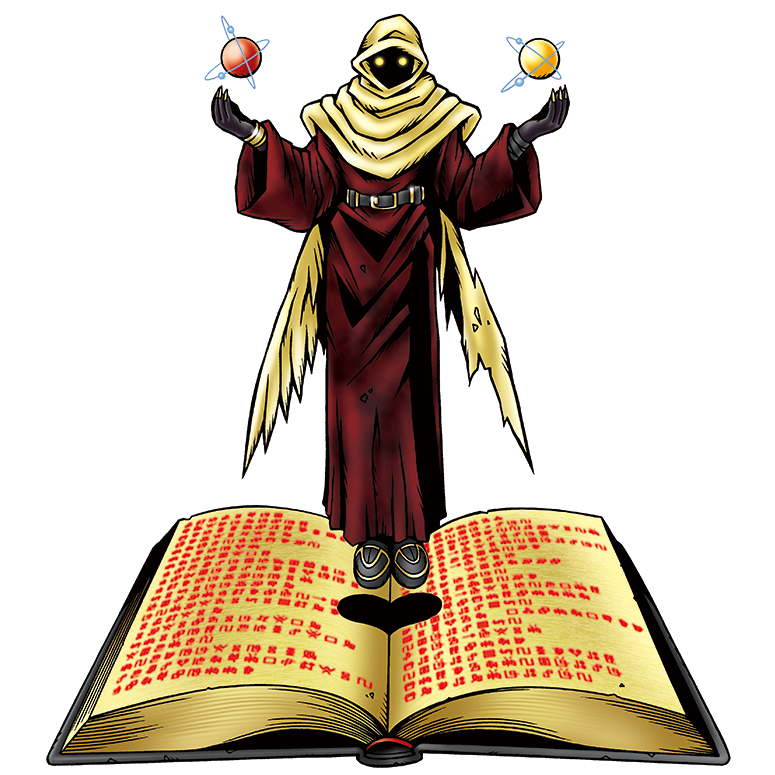 The Space-time Stones it holds in its hands are able to playback a record of a space, preserving every event or object of the Digital World within space and time. 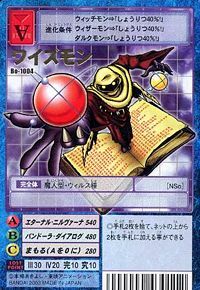 Its Special Moves are repeatedly preserving opponent's attacks within space and time and then performing a high-speed playback (Pandora Dialogue), and confining the opponent within the Space-time Stones for an eternity (Eternal Nirvana). 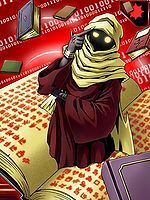 A researcher Digimon who seeks explanations for the mysteries of the Digital World. Treating the Book as a spiritual vessel, it can appear anywhere in time and space via the Book. 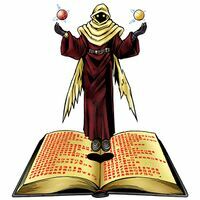 Its Special Moves are repeatedly preserving opponent's attacks within space and time and then playing them back at high speed (Pandora Dialogue), and confining the opponent for an eternity within the Space-time Stones it holds in its hands (Eternal Nirvana). 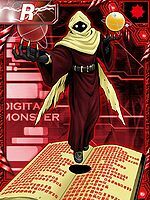 Anime/Manga Digimon Xros Wars: "Wisemon, The Secret of the Digital World!" 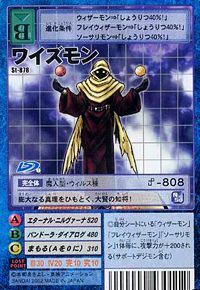 Eternal Nirvana  エターナル・ニルヴァーナ Etānaru Niruvāna Imprisons the opponent within the Space-time Stones for an eternity. 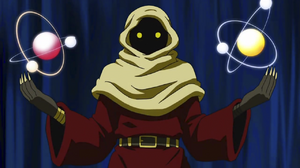 Pandora Dialogue  パンドーラ・ダイアログ Pandōra Daiarogu Repeatedly preserves the opponent's attacks within space and time, then plays them back at high speed. 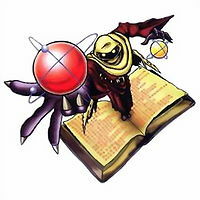 Wisemon is a member of Xros Heart. He is a researcher who uses his Book to travel safely in the Digital Space between Zones. He tends to see others only as lab animals, including Kudou Taiki. 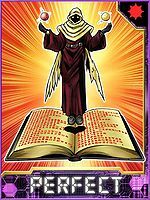 He sacrificed the Book to save Taiki from Arkadimon. Since then, he's decided to set his lab back up... in Taiki's Xros Loader. This sagely general of knowledge peruses through the great truth! This page was last modified on 11 April 2019, at 23:28.